The SQF Code, Edition 7, is a process and product certification standard based on the international standard ISO/IEC 17065 for use by all sectors of the food industry, from primary production to transport and distribution. The main feature of SQF certification is its emphasis on the systematic application of HACCP for control of food quality hazards as well asfood safety. The implementation of an SQF management system addresses a buyer’s food safety and quality requirements and provides the solution for businesses supplying local and global food markets. 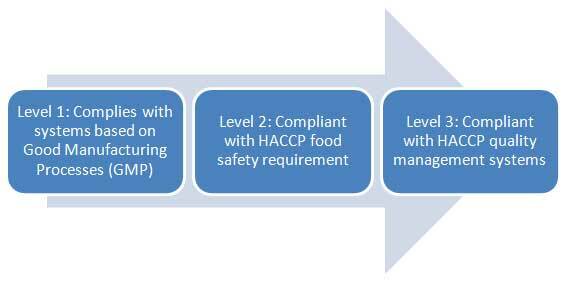 With this standard, SQF helps make food safety certification more attainable for companies by dividing the process into three steps: from Level 1, which incorporates fundamental food safety controls appropriate for low-risk products; all the way to Level 3, indicating a comprehensive implementation of food safety and quality management systems development. SQF certification can be attained at each level, however at least level 2 must be achieved in order to attain GFSI-recognized certification. If a business achieves level 3, it may display the SQF quality shield on its products (being able to display certification on the products in addition to the system provides additional brand value and consumer confidence). Preparing for SQF certification involves seven key steps with an additional four optional steps. The first step in becoming certified is to learn about the SQF Code. This can be accomplished by attending an instructor-led “Implementing SQF Systems” training course offered by a licensed SQF training center; taking the online “Implementing SQF Systems” training course available through the SQFI website; self-directed learning by downloading the SQF Code from the SQFI website; or taking the “Implementing SQF Systems” online examination accessed from the SQFI website. The next step in the SQF certification process is to select the relevant modules of the SQF Code. Recognizing that food safety practices differ depending on the food safety risk to the product and process grown, handled or produced, SQFI designed the SQF Code to meet the individual requirements of each industry section, outlined in each module of the Code. The third step is to register in Reliance. To be considered for certification, suppliers are required to register in the Reliance system, found on the SQFI website. Registration is annual and there is a fee per supplier site. An optional step at this point in the certification process is to utilize the services of a registered SQF consultant. All SQF consultants are required by SQFI to provide documentation that they have appropriate industry and food safety experience in a particular food sector category necessary to develop, validate and verify a supplier’s SQF System. The fourth step is to designate an SQF practitioner. Unique to the SQF program, every supplier is required to have a suitably qualified individual on site to validate and verify the food safety fundamentals and food safety and food quality plans. Many companies choose to have their practitioner, key personnel, and senior management participate in “Implementing SQF Systems” training. This course introduces the organization to the SQF program and the SQF Code and allows not only for ease of implementation, but demonstrates commitment to the food safety program. Next, the supplier will need to choose their level of SQF certification. Described above, the levels are based on the needs of the customer and the stage of development of the company’s food safety and quality management systems. Getting into the heart of the implementation process, the next step is to document and implement the food safety and/or quality management systems. The chosen modules of the SQF Code can be used as a checklist to assure all key controls have been implemented. SQF makes guidance documents available for those suppliers who would like help in the interpretation of the Code. At this point, the supplier will choose a licensed and accredited certification body to conduct the certification audit and issue the SQF certificate of registration. Lastly, an optional “gap analysis,” or pre-assessment check, may be conducted at the discretion of the company prior to the official food safety certification audit. For more information on SQF, visit the SQF website atwww.sqfi.com. To have more articles like this emailed to your inbox,become a GFSR Member today!